On 22/07/2005 56057 along with a short permanent way train was chartered by the EMRPS. The next twenty two images illustrate the days events. 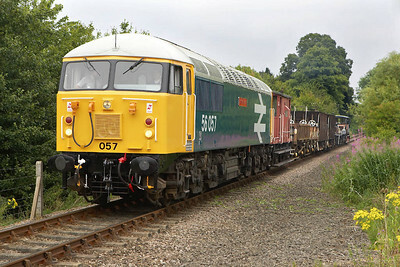 Here 56057 is pictured in Wansford Cutting prior to its first run past of the day. 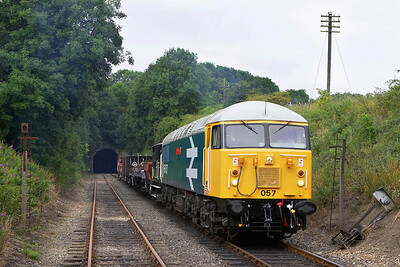 56057 storms out of the 617 yard long Wansford Tunnel on 22/07/2005 with its first run past of the day. 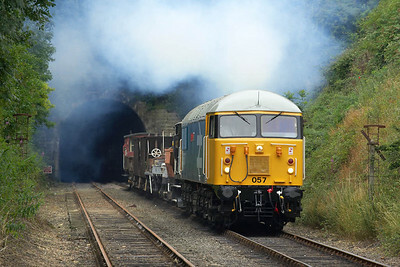 56057 lays down the clag as it passes through Wansford cutting on 22/07/2005 during its first run past of the day. 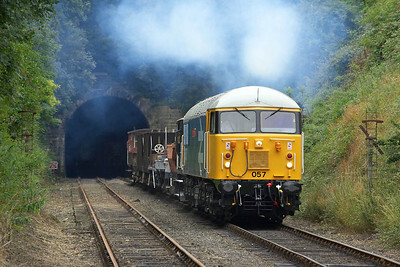 The characteristic exhaust of the class 56 is clearly visible in this photo of 56057 exiting Wansford Tunnel on 22/07/2005 on its second run past. 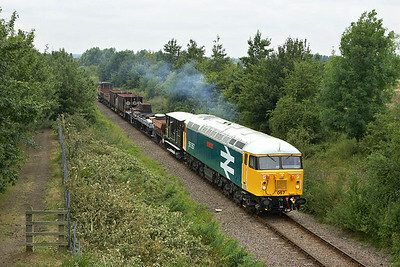 56057 runs past the gallery in Wansford Cutting for the second time on 22/07/2005. 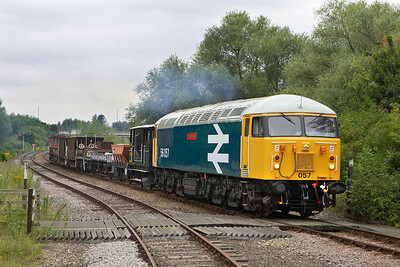 Note that the stock usually stored on the near line was removed prior to the photo charter commencing allowing this and the previous four photographs to be taken. 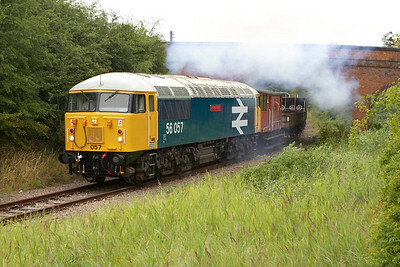 56057 awaits the road into Wansford station after providing the entertainment with a couple of run pasts during the EMRPS photographic charter of 22/07/2005. 56057 has been given permission to advance to Wansford station, the second man looks back to check all is well as 56057 gets the train rolling on 22/07/2005. 56057 sits in Wansford station on 22/07/2005. 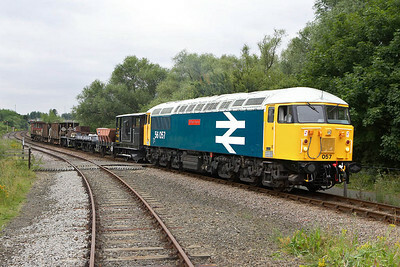 56057 is posed for the gallery at Sutton Cross after completing a couple of run pasts on 22/07/2005. 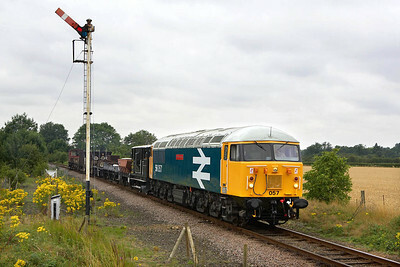 56057 is pictured at Mill Road, Castor during the EMRPS photo charter of 22/07/2005. 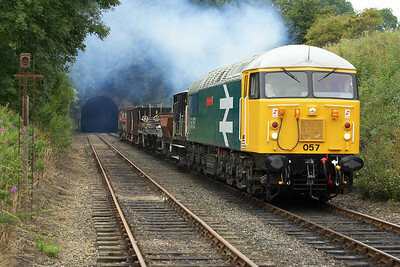 56057 is pictured during its first run past at Longueville Jnct on 22/07/2005. 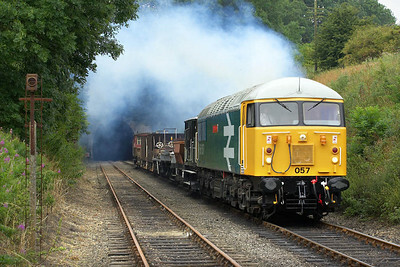 56057 is here seen awaiting instructions at Longueville Jnct on 22/07/2005. 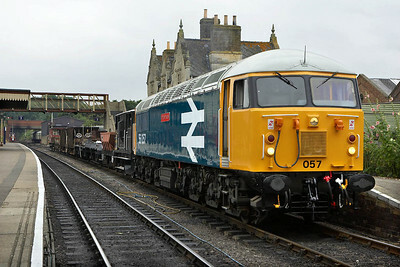 56057 is posed at Longueville Jnct on 22/07/2005. 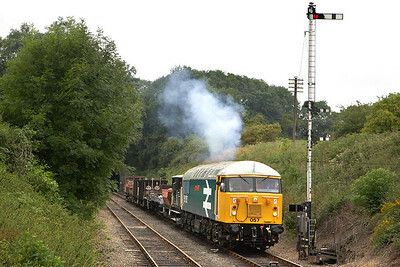 56057 is pictured at Longueville Jnct on 22/07/2005 during a very brief moment of sunshine. 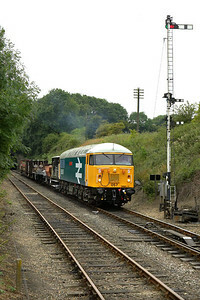 56057 is pictured at London Road, Old Fletton on 22/07/2005. At this point the train is only a couple of hundred yards from the ECML. 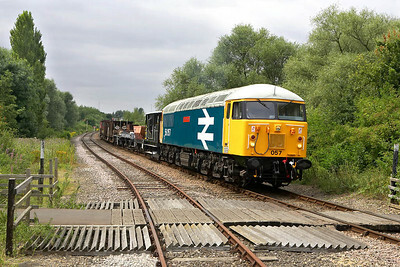 After propelling back off the Fletton branch, 56057 enters Orton Mere on 22/07/2005. 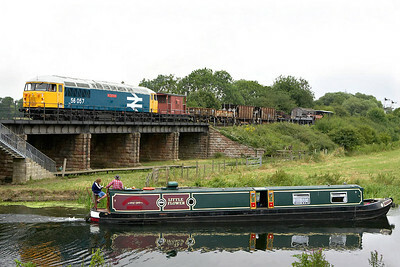 As 'Little Flower' passes by on the River Nene, 56057 awaits entry into Wansford station on 22/07/2005. 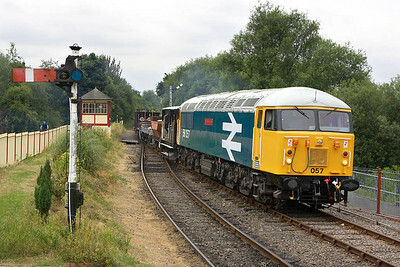 All eyes are on 56057 as it draws forward into Wansford station on 22/07/2005. 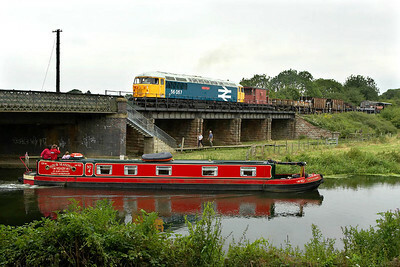 56057 is posed for the gallery near to the Lynch River bridge on 22/07/2005. 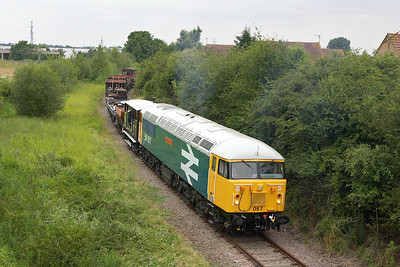 Yet another smokey performance as 56057 undertakes its first run past at London Road, Old Fletton on 22/07/2005. 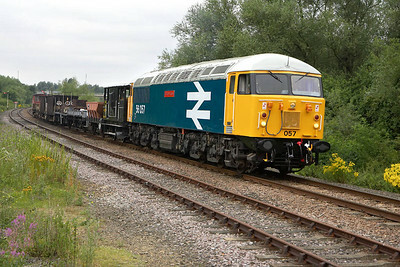 Pictured on its second run past at Orton Mere, 56057 comes off the Fletton branch on 22/07/2005. 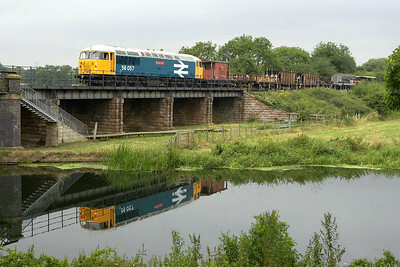 With a perfect reflection in the River Nene, 56057 is photographed awaiting entry to Wansford station at the end of the EMRPS photo charter of 22nd July 2005. 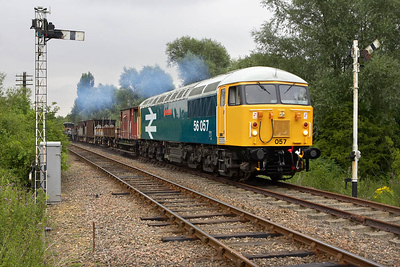 £1038 was raised for the Nene Valley Railway, an additional £200 raised towards the cost of a new traction motor for 56057, and a collection for the crew raised £38 for them to have a drink on the EMRPS. A great day all round.